“Pedestrian, bus is turning,” is the new warcry of the average DC Metrobus. Starting this Fall, you might have heard this on a few of Metro’s test buses, but now they’re rolling it out across the city in a pilot program. 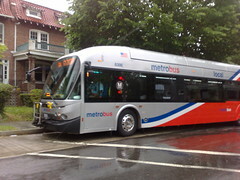 As soon as the operator of a Metrobus turns the wheel 270°, the bus will announce inside “Caution, look both ways” and the speakers outside will announce, “Pedestrian, bus is turning,” to warn people near the now-turning bus. Now, I’m not sure why an after the fact warning is necessary, once you’ve turned the wheel of a metrobus 270°, you’re already well into the turning process, but it’ll certainly be a lot more audible than the already loud buses. We’ve got demonstration video after the cut. The buses have ambient audio microphones, and will make the recording louder when surrounded by a lot of noise, and quieter at night when there is less noise, but the test units that rolled out along the G8 route in my neighborhood drew some complaints on the neighborhood listserve. Have you heard the new announcements? What are your thoughts? Should buses be making these announcements all night in residential neighborhoods?